After buying a new home and ordering 8 yards of mulch to repair neglected flowerbeds in my front and back yards, I quickly realized I lacked one major tool for the job: a working wheelbarrow. While my home’s former owners kept a decorative wheelbarrow in one of the flower beds, my intentions of using it were squashed when I noticed the wooden handles were splintered (which a pair of decent gardening gloves could handle) and the wheel was mangled. Upon inspection, I noted that the wheel would have to be fully replaced due to the design, so I opted instead to buy a new wheelbarrow. I had never even used a wheelbarrow before, so I did not have a long set of purchasing criteria. I did know that it had to be lightweight (I have a small build) and durable, as I would be hauling landscaping pebbles as well as mulch. I also desired it to have a re-inflatable wheel. I decided on a Union Tools wheelbarrow. Being already at the store and needing to make the purchase that day, I had not read any product reviews, nor was I familiar with the brand name, but I felt confident about the product after a few test drives down store aisles. It features a black stainless steel tray that has held up remarkably well after holding 750 pounds of landscaping stone and about 6 yards of undyed hardwood mulch. The inside is barely scuffed. I was worried that the tray would be too shallow, but I found that the 4 cubic foot capacity was perfect for me to fill to the brim and easily maneuver trip after trip without much physical exertion. A deeper tray, I think, would tax my 5’2” frame if filled completely. If you are taller or more built, you might be better off with a deeper tray to allow fewer trips. The handles are made of smooth wood. They seem sturdily attached to the frame and provide equal balancing when I am wheeling it around the yard. The handles appear to be clear-coat sealed, so hopefully they won’t deteriorate as quickly as the handles on the decorative wheelbarrow. 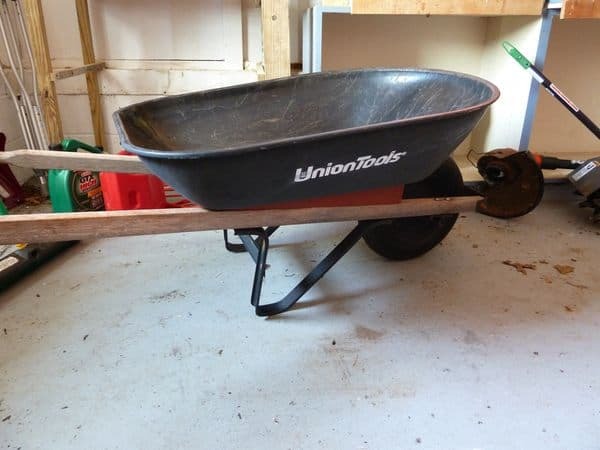 I house the Union Tools wheelbarrow in my garage so protection from the elements should decrease the rate at which the wood degrades, if at all. My favorite feature is the wheel itself. I can best describe it as: “shock-absorbing,” “bouncy,” “study,” and “full control.” My house sits upon a slight incline and the land slants downward on all sides of the house. Further, do-it-yourself backyard projects resulted in some pretty bumpy slate paths, while the right side of my yard is a steep hill leading into a fence. I was able to steer the wheelbarrow across all sides of my yard with ease. It even handled large bumps over railroad ties and held its load safely. After a few days of particularly heavy use, I returned to the garage and found the wheel half deflated. At first I thought I ran over a thorn as I was pruning rose bushes. However, it only took about one minute of air from my bike pump to get the wheel back to full psi (indicated directly on the tire) and I was back to work. I have not had to re-inflate the tire since. The downfall to this wheelbarrow, however, is the undercarriage frame. The frame has become slanted and unsturdy, possibly due to heavy loads of stone, possibly due to positioning it on uneven terrain. Now, the wheelbarrow leans to the right when filling. This isn’t yet a functional problem—the wheelbarrow still stands on its own and steers well—but this could potentially be an issue with continued use. More immediately, the slanting wheelbarrow often takes me by surprise, and I sometimes flinch when it begins to lean like it may fall over completely. It has yet to do that. I think tightening the bolts attaching the frame to the tray may correct this problem, but I have yet to try that. I’m not sure how long I lasted as a gardener without a wheelbarrow, but I can tell you those weren’t fun times. Overall, this Union Tools wheelbarrow is an affordable option ($100 or less) for a no-frills low-capacity tool. A published writer and novice gardener, Stephanie Lezotte dabbles in over 1500 square feet of newly purchased gardens that yield hundreds of tulips, daffodils, hostas, and daylilies. She enjoys trying new gardening tools and techniques and isn’t afraid to get (a little) dirty.